Texas Water World designed with unique western theme. The entertainment facility features a long and varied list of activities and special living areas - from a golf course, marina, aparts, villas, food street, located on a large coastline. It is one of the largest waterpark of China. Polin's award-winning King Cobra waterslide was uniquely rethemed into the Armadillo. It is a great example of a self-themed waterslide. The park called it as Cobradillo waterslide. 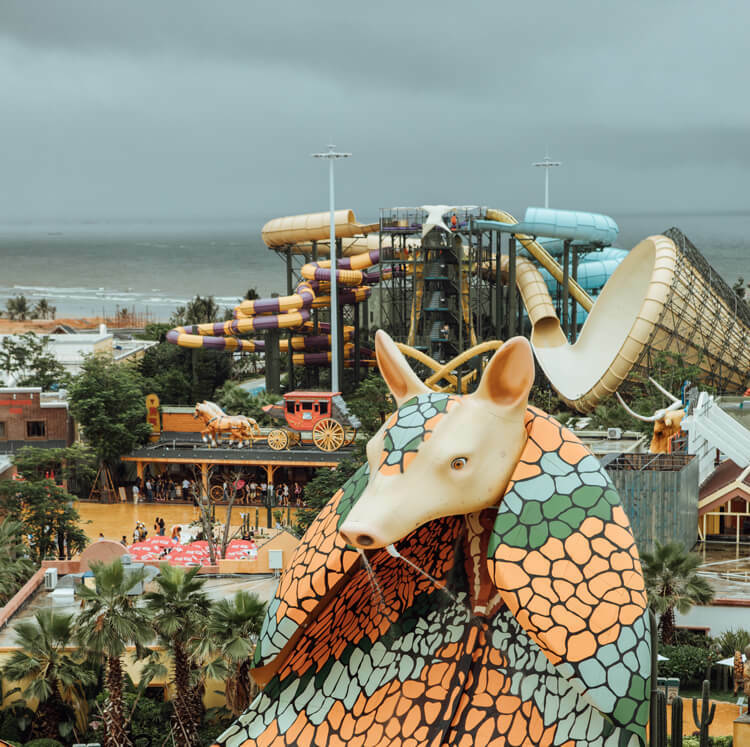 There are thrilling and signature waterslides like Cobradillo (Armadillo Themed King Cobra), Magicone, Family Space Boat, Uplooping Rocket, Twister Racer, Rocket Freefall. The all waterslides are all uniquely designed for the park. Most of them are fusion, combination waterslides that offer thrilling ride experience. At the same time, all the waterslides are RTM manufactured and they feature natural light effects. Water Play Structure in the waterpark, is western themed and one of the largest in China. There is Spray Park in the kiddie zone separately of the water play structures.